The AVerMedia Technologies' Live Gamer EXTREME 2 (GC551) card is available for Rs 20,000 and the Live Gamer Portable 2 Plus (GC513) is priced at Rs 22,990. 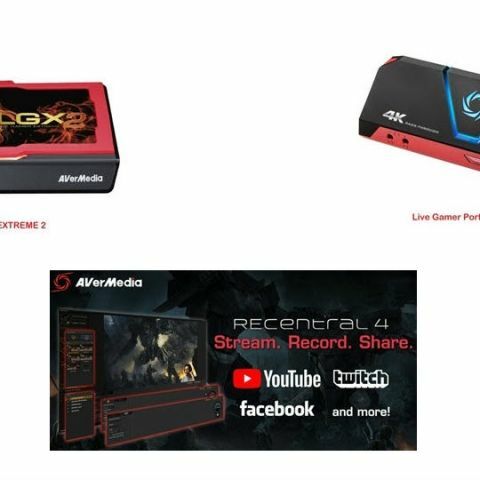 AVerMedia Technologies has announced that its Live Gamer EXTREME 2 (GC551) and Live Gamer Portable 2 Plus (GC513) premium capture cards with 4K capabilities are now available in India. The Live Gamer EXTREME 2 (GC551) card is available for Rs 20,000 and the Live Gamer Portable 2 Plus (GC513) is priced at Rs 22,990. AVerMedia Technologies, Inc., the preeminent name in digital multimedia technology, today announced its plans of distribution of 4k capable premium capture cards in India. The company targets majorly to focus on Live Gamer EXTREME 2 (GC551) and Live Gamer Portable 2 Plus (GC513) gaming cards through its distributors Abacus peripherals and Tirupati Enterprises in all major metros as well as B class cities. The efforts are being put to increase reach and meet the demand for these units across the country. According to the recent reports of 'Streamlabs Livestreaming', in 2017 alone YouTube grew by a whopping 343% in monthly active streamers, while Twitch grew by 197% globally. In 2017 alone, around 666 million people around the globe tuned in to gaming video content made by fans and publishers, and that number is expected to grow to over 740 million by 2019 says another report from 'Statista'. With growing broadband penetration, improved internet speeds over the last few years and increased opportunities to monetize content, videogame streaming in India is on the verge of a breakthrough in India too. Live Gamer EXTREME 2 (LGX2), the successor of the vastly-popular Live Gamer EXTREME (LGX), is a game capture box capable of recording/streaming 1080p60 gameplay from PC or game console while allowing stunning 4Kp60 visuals via its pass-through technology. The LGX2 also inherited the Ultra-Low Latency capability from the LGX which allows for uncompressed data capturing with near-zero latency. This instant viewing greatly improves creators' workflow and overall recording experience; streamers with one monitor can seamlessly play and broadcast fast-paced games right in the preview window with minimum lag. Featuring wide connectivity, hardware compression capability, and a revamped RECentral intuitive user interface (v4.0), the LGP2 Plus is the first capture card to offer 4Kp60 gameplay while recording at 1080p60 footage without a high-spec PC. Thanks to the portable nature of the device, it can even record gameplay, commentary audio, and party chats directly to a MicroSD card, making it an essential tool for streamers and gamers to capture and share epic moments no matter where they are. UVC Plug and Play also means the LGP2 Plus is compatible with any platform, making it an accessible card by removing the need to install any drivers. Additionally, the card offers MP4 and MOV recording for easy editing and efficient uploading across a variety of services. Apart from the hardware AVerMedia also offers powerful yet user friendly free software bundle RECentral and CyberLink PowerDirector 15. This all-around feature packed editing tools lets users to record, stream, edit and share the quality content they generate in simplest way. Both the products are available immediately through authorized AVerMedia retailers and distributors. when will samsung launch its galaxy S5 mini in india??? Is Enkay Technologies india pvt ltd selling there company to syntel? ?